A Chicago man who was seen on camera viciously punching a female security guard who was trying to assist him after he vomited has been arrested, police confirmed. According to the New York Post, 23-year-old Matthew De Leon was charged late Tuesday with three felony counts of aggravated battery after being identified as the man who punched 46-year-old Zoa Stigler early Sunday morning after vomiting in front of the building where she works. De Leon surrendered to police Tuesday, saying through a representative that “there are consequences he knows he has to face,” according to the report. Stigler suffered injures—including a broken bone below her eye and a broken nose—for which doctors advised she may need surgery. In footage of the incident, Stigler can be seen walking outside and standing next to De Leon, who is sitting on the ground. Stigler said she was checking on him to see if he needed help. After a few minutes, she decided to call 911. Police drove by but did not stop in the area, earlier reports noted. A few more minutes went by, and a woman accompanying De Leon showed up and he started vomiting, video footage showed. Stigler went to get a mop and bucket to clean up the mess and then told the man and his friends—two more of whom had popped up—to move on. The man then first threw water from a water bottle at Stigler before punching her hard in the face, video footage shows. “He didn’t show any remorse. 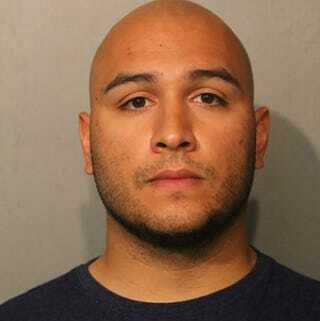 He didn’t say anything, and he just punched me,” Stigler told NBC Chicago at the time. The building where Stigler was working, a condo complex, set up a GoFundMe page to help pay for Stigler’s hospital bills and recovery. The campaign has raised some $22,977 of its $30,000 goal in the past two days. Read more at the New York Post and the Chicago Tribune.